Röntgen had the same sort of ground-plan for his three cello concertos. There is, if you’ll forgive the allusion, not very much in the way of introductory foreplay. He tends to get stuck right in. The mission is to integrate the solo cello without any Late-Romantic bluster, but the insinuation can take a variety of forms. In the case of the 1893 First Concerto, he launches a long cellistic cantilena interrupted by brief orchestral chords. This quasi-cadential approach is Röntgen’s metier and something of an idée fixe, in fact. 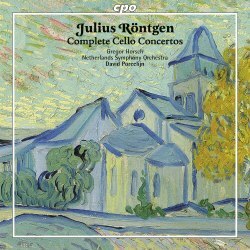 Certainly there must be some influence via his cousin, Julius Klengel, the great cellist whose own concertos presumably had an influence on Röntgen’s own. Sub-divided into three movements this concerto has a Schumannesque feel, not least in regard to proportion. There’s a substantial first-movement cadenza. The central movement is lightly orchestrated, deftly drawn and charmingly projected. It’s an Intermezzo, in effect, at least in my book, though it’s defined as a poco andante. His finale seems to reference Paganini’s La Campanella for some reason, and though there are also hints of a Sarasate influence, the music isn’t overtly virtuosic; it’s more a question of a different rhythmic stamp especially as the concerto ends genially. The Second Concerto was completed in 1909, a period during which he became great friends with another even greater cellist, Casals, who premiered it in Paris in June of that year. The cello starts unaccompanied - the familiar Röntgen trope. The oboe plays a lovely second subject theme in homage to Grieg who had died in 1907 and was on Röntgen’s mind. For a moment the music veers off its axis toward Peer Gynt. This single-movement work is clearly sub-divided and there’s an especially appealing slow section in which an Irish folk-song is evoked. It’s very similar to Siúl A Rún which is the less surprising when you realise that Rontgen had just finished writing a piece for cello and piano called a Fantasy on Irish Folk Songs. It sounds for a few minutes like the Cello Concerto Hamilton Harty never wrote. The work ends con brio; another defining trait here, each concerto begins in the minor and ends in the major. The Third Concerto dates from 1928. Once more, we’re straight in with the quasi-cadential cello solo. This time a celesta is used, and there’s an element of birdsong that adds new sounds. The orchestration remains lissom and light, but the final cadenza has more than a hint of Brahms about it. There are competitors out there. On Etcetera KTC 1329, Arturo Muruzabal is accompanied by Paul Watkins in the first two concertos and by Henrik Schaefer in the Third (see review). CPO’s 2006 recording is the more immediate and detailed, whilst Muruzabal’s tone is rather more gruff and darker than that of Gregor Horsch. The CPO performances and recording reflect well on all concerned and the notes are helpful. I can’t help feel that Röntgen didn’t quite vary his material or his structures enough over the course of these three works. There’s much that is likeable but not a great deal that is genuinely memorable. For all that, we should certainly hear one of the concertos in concert from time to time. It would make a change, and the second and third are very short.